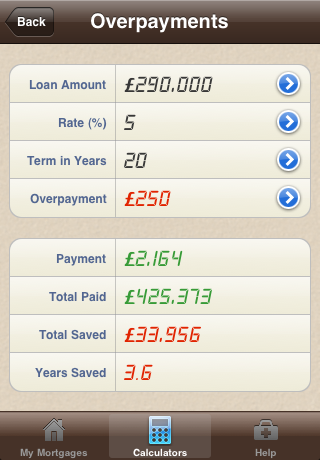 Loan Calculator iPhone and iPad App has one aim: to save you money on your loan! If you're taking out a loan, looking to organise your loans, or want to pay off you loan early, then this is the perfect loan app for you. 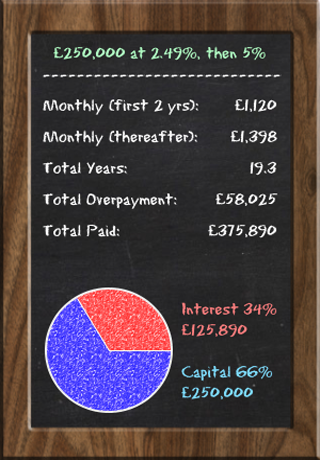 Q: Want to instantly know your monthly payments, or how much you could 'save' by overpaying a monthly amount? A: The calculators will answer these questions in a flash. They are specially designed to be quick and intuitive to use. Q: Want to easily see how much your loan will cost you over 5 years, 10 years, or more? A: You can view the monthly breakdown in a table or visualise it in a simple, easy to understand chart. Q: Want to compare multiple loan deals side by side? 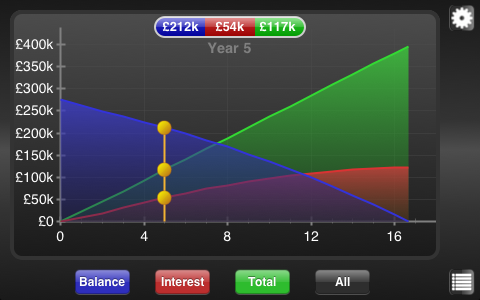 A: Simply choose up to 4 loans, flip the iPhone on its side, and visualise the figures side by side in a colour coded chart. 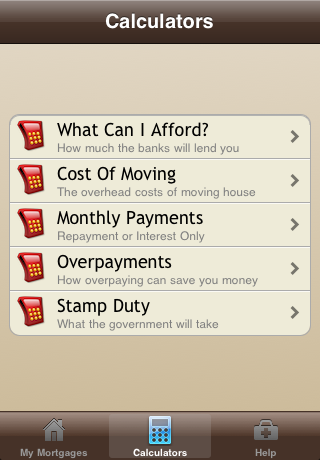 To get started with this app you need to enter a few basic details about your loan. Once entered, the loan is automatically saved and you can view an analysis. Simply flip the iPhone on to its side and you are presented with a breakdown of the monthly payments. 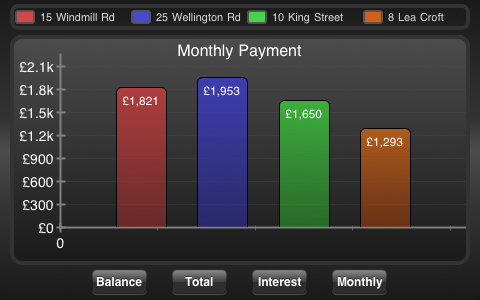 Press the chart icon to 'visualise'	the payments throughout the term of the loan. If you want to compare mulitple loans then enter details of two or more loans. 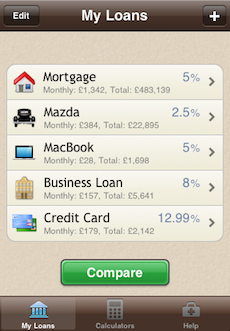 Press the 'Compare' button, select the loans you want to compare and flip the iPhone on its side again. 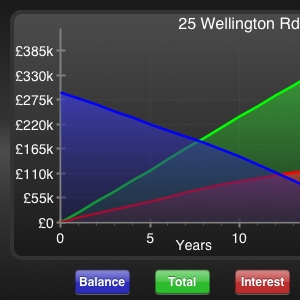 You can then clearly picture the loan costs side by side in the chart. The iPad version of the app takes advantage of the bigger screen to make it even easier to use. 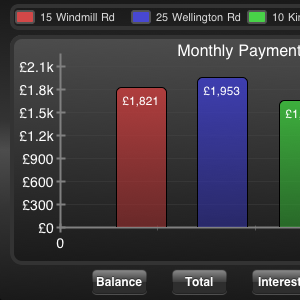 Once you have entered the loan details, you can quickly switch between the summary, breakdown and chart using the buttons at the top. 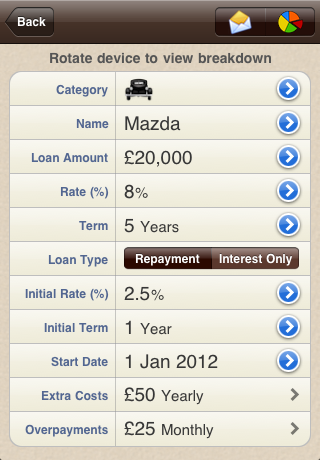 In 'Compare' mode, as soon as you select a loan on the left hand side, the comparison view is updated on the right hand side. For instant answers to questions such as 'How much will a loan cost per month? ', then switch to the Calculators tab. Here you will find a set of loan calculators which will answer these questions in a jiffy. See below for a full list of the calculators provided. Loan Calculator is designed to provide all the tools needed in order to make an informed decision on your loan. It was borne through the desire to create a loan app which went beyond the many basic loan calculators available for the iPhone and iPad, and which gave a full and clear picture of the costs involved.